Julia Paulsen said Christmas isn’t a major holiday in Indonesia since most of the population is Muslim, with only about 10 percent who are Christians. So it’s a day for being with family, with maybe a song or some other moment recognizing the occasion. When she moved from her homeland to Longyearbyen with her husband Didrik three years ago her first Christmas was considerably more festive. Photo by Mark Sabbatini / Icepeople. 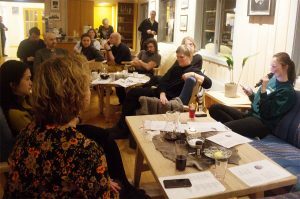 “The first time I celebrated Christmas in Norway I was like ‘Oh wow, this is so special,” she said during a Christmas party for Svalbard’s international residents Tuesday night at Svalbard Church. But Paulsen also quickly discovered the elements that make plenty of long-time revelers weary such as commercialism and buying gifts more out of obligation than goodwill. So the couple and their daughter born shortly after they moved here are in essence returning to their version of a traditional Christmas. “This year we’re going to celebrate it at home, just us,” she said. But the core of that celebration – family – is the common element that binds the people attending Tuesday’s party, based on the traditions, songs and experiences from their homelands they shared. 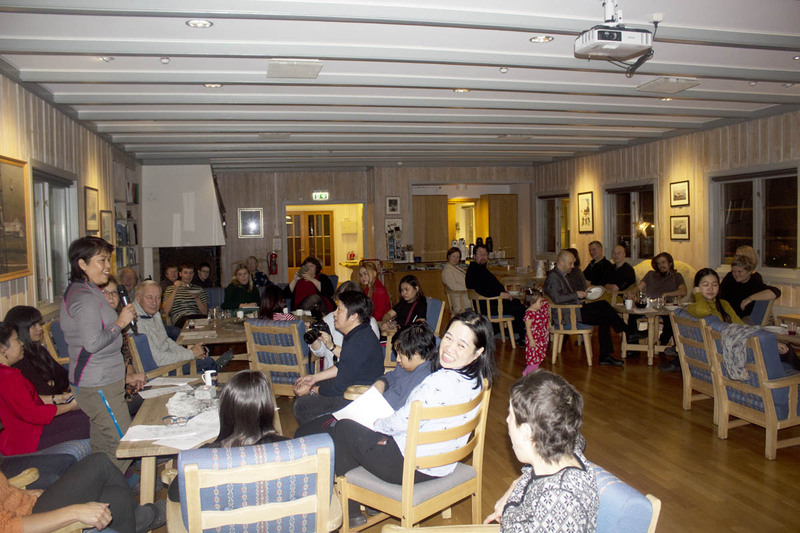 While the roughly roughly 40 people at the church didn’t even allow one person for each of the more than 50 countries that are represented by residents in Svalbard, there were still plenty of diverse tales. Being on Norwegian soil meant sharing a meal of rømmegrøt (a sour cream porridge typically served during holidays), kransekake (thin stacked rings of dense almond cake) and gløgg (traditionally mulled wine, but obviously in non-alcoholic fruity form here). But instead of visions of sugarplums, those at the party could envision a Filipino meal of lechon (whole roast pig), spaghetti, traditional breads, cola and more. In Britain it was “mostly turkey and gammon (ham),” plus assorted other items such as pigs in a blanket (sausages wrapped in bacon). While guests were invited to bring a song to share, only residents from two countries did so. About a dozen Filipinos – who frequently are the largest group of foreigners at the annual party – performed a couple of pre-planned holiday songs to great acclaim from the audience. A more impromptu, if equally appreciated, performance was a solo rendition of a Russian song whose title translates to “The Christmas Tree Was Born in the Forest” by Natalia Smirnovov, a St. Petersburg native who read the lyrics from her phone after being asked if there was a song she used to sing back home. “Everyone knows this song in Russia,” she said. Smirnovov, who will be celebrating her second Christmas in Longyearbyen, said she doesn’t yet have any plans for the holidays. But being far from home in an tiny isolated town enveloped in continuous darkness doesn’t dampen the mood of the season.